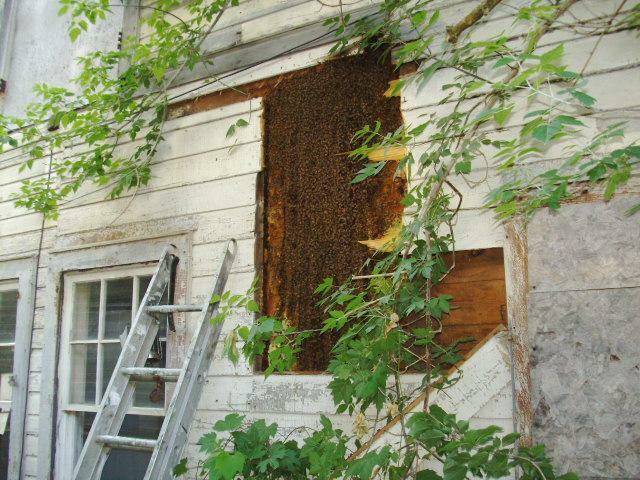 I am humbled and in awe of this Old Family hive, which I removed in Copake, NY, in June, 2010. They wintered in Germantown and came through strong. There was three buckets of honey. A beautiful queen. I did not wear a veil. These are the bees that traverse dream and reality. I am under their tutelage. I’ve recently finished reading Honey Bee Democracy, the new book by Tom Seeley at Cornell. In the book, he describes 60 years of swarm behavior observations, from Martin Lindauer to present. Not only are the dances of the scouts decoded, but Seeley has investigated how the hive mind furiously dance-debates potential nest sites, then reaches an accurate and timely decision, and then acts on it (10,000 bees at once), much like the three-pound human brain thinks. Seeley goes further to compare the mental capacity of the hive to decision making at New England Town meetings, what he calls, “arguably the most authentic form of human democracy in the world,” where decisions are made in regards for the community, both individuals and the whole, and leadership is restricted, if present at all. Seeley’s countless experiments together add mesmerizing depth in our understanding of hive wisdom. It is the most all-encompassing research I have seen that reinforces the fact that the hive can do anything. There are certain bees that make it possible. And it concludes that bees could even guide humanity to a more peaceful future. I hope that this book, like this epic Copake hive, makes beekeepers pause and consider our intrusions. How could we know better than the bees? Bees teach patience, resilience, and thankfulness for nature’s gifts. They teach us to respect them, to work with them rather than control them. Today, bees have been forced to work in an agricultural model that poisons and malnourishes the hive. The demand for performance requires selective breeding, shallowing their gene pool and creating a welfare state for our bees– hives that cannot survive without chemical treatments and artificial feed. They live on plastic comb and are not allowed to swarm. Then they are at the mercy of a climate destabilized by Global Weirding. And yet the bees still thrive. They are wild. It’s time to unveil the nighmare that is "American Beekeeping.” Not for the sake of the bees, who will bee just fine once these sacrileges cease, but for the sake of the beekeepers and every person’s relationship with land, food, love, and fear. After a devastating 2009 of trials and tribulations, the bees of 2010 rebounded and once again made honey, enough so that I did not take any hives south. They survived- 75% made it through this past cold winter in NY. Nosema and weak genetic were culled out; the bees were stronger for it. The more they die, the more they live. I appreciate what all beekeepers do. They are always helpful. Many are receptive of new ideas that “work” and are profitable. Their innovation and work ethic are inspiring, but not to be like them, not for me. Not to be locked in to meet a grower contract, a payroll, or a bill for more medications and fake bee feed. I don’t need to follow the regime, and the bees don’t need what we call “help.” I am not out to prove anything. Farming with money is not really farming and I would lose the edge. When everything clicks, keeping bees is certainly profitable and a viable means of livelihood for the right person, but having bees is not a job. It is not an anticipation of results. Instead, bees are a guide to become more harmonious and accepting and less judgmental. They are a healing force in my life. The bees are the vehicle and our vaccine for PCD, People Collapse Disorder, but the beekeeping community is still in denial. I can’t condone supply companies selling a plastic, stressful world and treatment program to someone who wants to keep two hives alive in the backyard, never move them and not care about honey. The system is so unbalanced you can't fix once it's awry. How can I let this standard practice continue when I know of wild hive families that have never died? How can beekeepers demand the cessation of chemical use on the fields when they are putting Tactic and all kinds of antibiotics in their hives? Our whole insect steward society is sick and voiceless. You, as a beekeeper, have the power to change that. In the spring of 2010, I stood in the desert of Arizona for the third year in a row, next to splits I had help make the year before. Once again I was in one of Dee Lusby’s bee yards, witnessing in action the only commercial beekeeper who never treated her bees (and still has bees today), some 700 hives producing, in this great year some 80 drums of honey. The industry still denies that large hives run commercially can survive without treatments, and that Dee’s bees are resistant to parasitic mites because of Africanization, isolation, and her shear faith. In turn, Dee began the yahoo organic bee list, now of some 4000 members, and she kickstarted the Treatment-Free Conferences held around the country. Dee’s don’t-back-down policy is tough and effective. This is my double message to a guilt-ridden industry that says this can’t be done. <> In the other corner of the country, with a quiet grace, Kirk Webster blesses us with his own line of survivor bees and survivor beekeeping, which he has shared with me in the past and shared with us all at the Northeast Treatment Free Conference in Leominster, MA. Meanwhile all is doom and gloom on the Industrial Beekeeping Front. Mostly I tell people that if they want to learn it go do it themselves, and then I sing a song about bees. > But I also tell them my advice to all newbees: DON’T BUY ANYTHING. We are taking back the Means of Production. This year many people went home after such a bee talk and built a bait hive. At least two of them I know of had their swarm of bees arrive. One was in New York City and likely saved that swarm from being sprayed. One was in Florida and the bees arrived two days after the box was built. Usually it’s not that easy, but sweet, free bees look for a new, safe home all the time. Maybe give the swarm some honey, but the next advice is DON’T DO ANYTHING. Let the bees grow prosperous. In 2010 there were swarms ebundant. And then the swarms set uop shop and swarmed again. YOU CANNOT STOP THE BEES. Coming and going. Building fervently and finding the materials so that some will live to do it again. Bee Prepared. And thriving in her third year. 2010 was a year of pushing limits and experimenting. Top bar hives have enabled me to bring in genetics and breed bees that (mostly) survive in my situation, even at times make honey, and to do it all myself without ever picking up a beekeeping catalogue. Yet I recognized some of the shortcomings of horizontal top bar hives- mainly the need for more frequent inspections to keep the combs straight and also to stir up the hive (put empty bars between drawn combs) to invigorate honey making. And I loathe mouse screens and wrapping. Frustration is an Inventor's tool. In 2010 I once again had too many hives to keep up with, running in a model of nuc production and honey harvesting. Meanwhile I started two dozen Warre type hives, vertical semi-fixed comb hives. http://thebeespace.net/warre-hive/ These bees are bottom supered in the spring, and honey is removed from the top in the fall. They are allowed to swarm and are never inspected, though it can be done, carefully, to appease a bee inspector, if we ever have one again in NY. How can I be cool with all the rules? In some bee yards the vertical hives wintered the strongest of all. I like them because of the self-imposed barrier, the automatic comb removal, and dead air space below the cluster, and above all- the advocacy of bees fulfilling their destiny to swarm. Right now I have skeps, gums, Langstroth hives, and soon a Bee TV. Who gives a buzz? Two hives have died in the last freeze- one was flipped in a storm, the other starved, as it was a first year swarm removed from a building late in the season. Feeding it all the honey in the world would not have helped this little cluster, and I had been using the bees for bee venom therapy to help heal people. Until one day the small, hungry cluster was frozen. The farmer’s only choice is to endure. Two years ago the group APIS M facilitated a form to contact the EPA when several systemic pesticides were up for review. I wrote to the EPA, stated I was a beekeeper and I knew I was surrounded by these chemicals, especially on the corn, apples, soy, and Franken-lawns around here, and I think the products should be removed from the market on precautionary principal. I knew several European countries had banned them for potential harm to bees and beneficial insects. I also knew that actual ground residuals far exceed what the manufacturer states. And all this is before we knew what we now know about guttation- the toxin-laced water that seeps from corn leaves and provides a drink for countless bugs. AND all this was before the public found out, through Wiki-leaks, that the EPA actually knew all this stuff and more. And now that the public knows, I also know not to blame a company for the insects’ misfortune when it’s the public that is using the product, and the media has something to do with who’s scared into doing what. Anarchy isn’t going to tell people what to do or not do. We’ll do it ourselves, and pockets of our resistance will outlast what cannot be sustained. You and your six hives of bees can join the global hive we are recognizing. It is teaching us how to bee. I am blueprinting the fragmites bee house, the Giant Skep, I will build when the mud dries up and live in. I am plotting the Bootcamp for Beekeepers here at the Germantown Farm in May. I am writing the 2011 (Fun Totale / Total Fun) Anarchy Apiaries Almanac mini zine. I am building Warre hive nucs. I am traveling, talking, singing and waggle dancing for 2011 (Fun Totale/Total Fun). Come 2012 we all go on permanent vacation. The bees are already there, so take the tip. Bee prepared for the spring swarms – get those bait hives up now! There will bee many swarms, and much honey. Get your bees set up, and let them swarm. Don’t live in fear. Honey is a wondrous thing to make the heart and spirit sing! Robin Hood is a myth. We are the reality.